Almost everyone loves to eat sweet, creamy ice cream treats covered with a crunch candy coating. Have you ever wondered how these wonderful desserts are made? 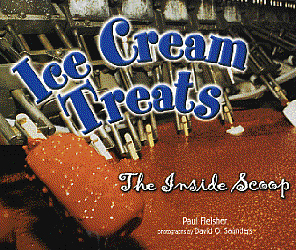 Join us on a trip through the old and new of ice cream, from the days before refrigeration to a modern ice cream factory. You’ll get an up-close look at liquid ice cream, huge vats of melted chocolate, and one of the coldest freezers this side of the North Pole.